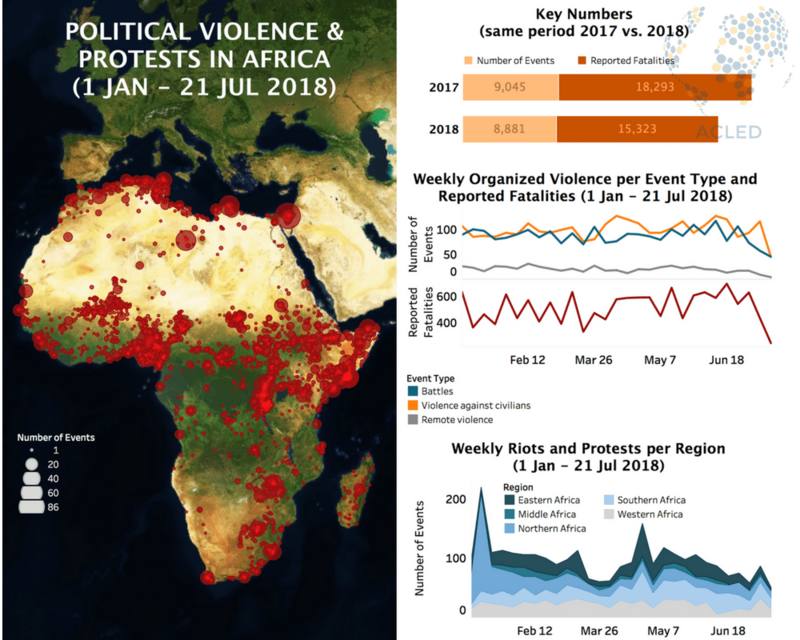 Key developments in Africa in the week of July 15th include increased attacks by Boko Haram in several states surrounding Nigeria, and targeted political violence in Zimbabwe and Burundi. Regular fighting also occurred in Somalia, Mali, CAR and DRC, while riots and protests dominated the political landscapes in Ghana, Kenya and North Africa. In Chad, Boko Haram carried out an attack on civilians at the village of Daboua in the Lac region, reportedly killing 18 people and abducting 10 women. Boko Haram had only been involved in two battles against the state forces so far in 2018, also in the Lac region. In Cameroon, Boko Haram militants also attacked civilians on three occasions in the Geldavi area of Mayo-Tsanaga, Nord-Ouest, between July 16th-21st. In Niger, they attacked a military position in the area of Baroua in Diffa. In Nigeria, they carried out two large-scale attacks on the Nigerian forces in the Bama and Jilli areas of Borno state over July 13-14th, after over a hundred soldiers were reported to have been missing and the Jilli base captured. The military denied the first attack in Bama but retaliated two days later by attacking a Boko Haram base in the area, reportedly killing 22. The week of July 15th was also marked by several incidents of targeted political violence. As Zimbabweans head to the polls to elect their new president in a week, violence and threats between the rival parties have continued sporadically. On July 16th for instance, soldiers in Harare beat activists of the Alliance faction of the Movement for Democratic Change, leaving them with severe injuries. In Burundi, tensions continue to run high in the post-constitutional referendum period. The Ruyigi, Makamba, Kirundo and Gitega provinces are in a state of high alert after nearly daily incidents of violence against civilians and harassment and intimidation by Imbonerakure youth over the past three weeks. Reports note that the Imbonerakure youths are already setting up security checkpoints in Ngozi province to collect contributions for the 2020 elections. Elsewhere in Africa, regular fighting was reported in Somalia, Mali, the Central Africa Republic (CAR) and the Democratic Republic of Congo (DRC). Al Shabaab targeted Somali security forces and government officials in several hit-and-run attacks throughout the week of July 15th, particularly in Mogadishu (Kahda, Wadajir, Heliwa, Xamar Jaabjab and Bondhere neighborhoods) and in Lower Shabelle. The militants also reportedly began forced child recruitment in Middle Shabelle, sparking off clashes with locals. Meanwhile, the Somali state forces used overwhelming force in their response to protests and other civilian activities in Mogadishu. In Mali, heavy fighting continued over July 18-19th between the Imghad Tuareg and Allies Self‐Defense Group (GATIA) and militants of the Islamic State and Group for Support of Islam and Muslims (JNIM) in Gao and Menaka cercles. In one ambush on a GATIA convoy in Tidimbawen, 16 militiamen and four civilians were reportedly killed. The period July 18-19th in CAR was also marred by violence between PK5 and KM5 militias in the capital Bangui; as well as by fighting between the Anti-Balaka and the MINUSCA and Union for Peace (UPC) forces in Pombolo in Mbomou prefecture. Finally, in DRC, fighting resumed between the Alliance of Patriots for a Free and Sovereign Congo (APCLS) and the Guidon faction of the Nduma Defence of Congo (NDC) over territory control in Masisi. Other relevant developments on the week of July 15th included the confirmed draw-down of UNAMID forces from Sudan’s Darfur. This is occurring in the context of continued fighting between the government and Darfur rebel groups and unceasing attacks on civilians by the paramilitary Rapid Support Forces (RSF). But also the three days of unrest in Ghana’s Ashanti region after police forces killed seven well-known members of the Zongo community and members of the New Patriotic Party (NPP) over alleged robbery; the student riots in Kenya over school management and exams, which have occurred across several areas already since the beginning of July; and the protests over electricity and water cuts in southern Algeria, Libya, and Tunisia.